There's some unsettling news for internet users in India. The Indian government is among the top five governments across the globe requesting search giant Google for data on users. 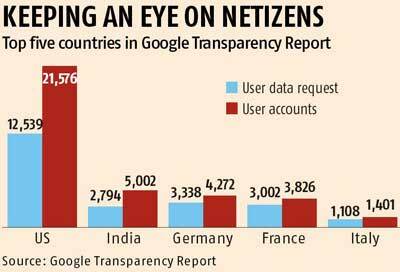 According to Google's 10th Transparency Report, when it comes to user accounts for which information was requested, the government of India ranked second in the world. The Indian government made 2,794 requests for the period January to June 2014 across 5,002 user accounts. The government request for data is classified under two segments - content removal and user data requested. 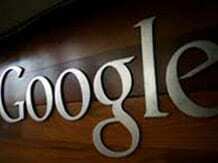 Google is yet to update the data on content removal requests from the Indian government. India was second to the US government, which made 12,539 requests across 21,576 accounts for the same period. Google received around 32,000 data requests from governments in the first six months of 2014, an increase of 15 per cent when compared to the second half of 2013, and two-and-a-half times more than when Google first started publishing the data in 2009. According to a blog by Richard Salgado, legal director, law enforcement and information security, Google, the numbers continue to rise worldwide. "We have seen a 150 per cent jump since we first began publishing this data in 2009. This increase in government demands comes against the backdrop of ongoing revelations about government surveillance programmes. Despite these revelations, we have seen some countries expand their surveillance authorities in an attempt to reach service providers outside their borders. Others are also considering similar measures. The efforts of the US Department of Justice and other countries to improve diplomatic cooperation will help reduce the perceived need for these laws, but much more remains to be done," he wrote. He said it was only Article 66A within the Information Technology Act that dealt with phenomenon called the internet or 'communication services'. "The term 'social media' is not even mentioned in the IT Act," he said. The other reason for the high number of data requests, say legal experts, is the fact that a vast majority of the requests will be beyond the scope of law. "Our authorities do not have the maturity to handle such a situation. Most of the time, data request would be done after some users would have commented negatively about a political party or a popular leader, and they (authorities) use the state machinery to initiate action," said a leading cyber law expert. As social media usage increases and individual user becomes much more concerned of his privacy, players such as Facebook, Twitter, Wikimedia, Yahoo and others have come out with such transparency reports. All these platforms have seen an increase of request from government agencies. In case of India, Twitter's transparency report said it received 16 account information requests for 44 user accounts for the period January-June 30, 2014. This number has almost doubled from 27 for the period of July-December 31, 2013. In case of the popular social media platform Facebook, it claims that total requests made by Indian law enforcement agencies for the period July-December 2013 was 3,598 across 4,711 user accounts.